To contribute a term you must first log on as a term contributor. Your server administrator should have provided you with login details and the appropriate role required to contribute terms. Enter your User ID and Password . (Optional) Change the Interface language . When you first log on as a term contributor, the following page is displayed. Tip: The appearance of this page may vary for your organization. Server administrators can customize the available fields and the appearance of the term contribution page . Term field Enter the name of the proposed term. Language dropdown Select the language of the proposed term. Domain dropdown Select the domain of the proposed term. Comment field Add a comment to the proposed term. Submit button Submit the proposed term. Customize the template to allow more settings to be displayed and changed . The Term Submitted page is displayed. (Optional) Click Submit Another Term to return to the term contribution page. Proposed terms are normally reviewed by terminologists, subject matter experts and technical editors. Unlike the term contributor, these users have regular access to the Dashboard and the Terminology Manager. By default, all contributed terms have the Status proposed in the Terminology Manager . The information in the Comments field can be used to gain additional information about a contributed term. For additional information about the reviewing and editing of terms see the Acrolinx Terminology Manager User Guide . Open the Acrolinx Term Browser. Search for the term you want to edit. Open the term help and click Add Comment . Tip: The appearance of the Add Comment link may vary depending on how your administrator has configured your term help template. (Follow this step if you are not already logged into the Add Comment page) Log on with your User ID and Password . Enter your comment in the text box. 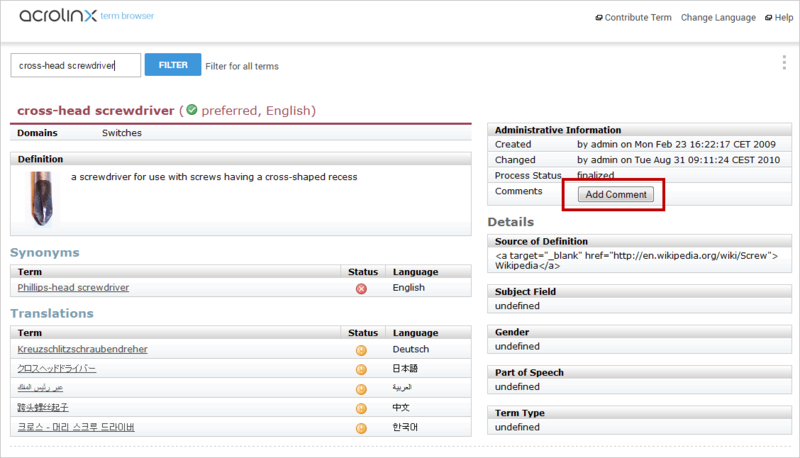 (Optional) Activate the checkbox Request review so that your terminologist can easily find your new comment. The Request review option is available if the Terminology Manager was configured correctly. If the Request review option is not available, your terminologist must configure the Process Status field to include the status review requested .